With its new colour filter arrangement and lack of a low-pass filter, the Fujifilm X-Pro 1 will produce better-resolution images than a full-frame camera with the same number of pixels, according to Hiroshi Kawahara from Fujiu2019s X-Pro1 project. 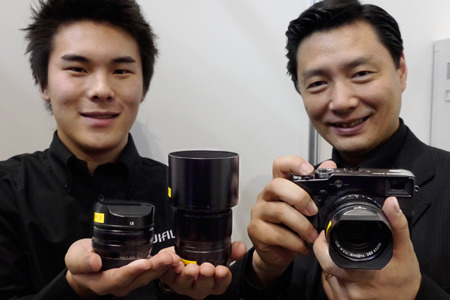 With its new colour filter arrangement and lack of a low-pass filter, the Fujifilm X-Pro1 will produce better-resolution images than a full-frame camera with the same number of pixels, according to Hiroshi Kawahara from Fuji?s X-Pro1 project. ?With our Fujinon lenses and the new colour filter configuration on our 16-million-pixel sensor, which doesn?t need a low-pass filter, the sensor of the X-Pro 1 will be able to resolve more detail than a conventional full-frame sensor.? Speaking at the recent CP+ Camera & Photo Imaging Show, Kawahara would not be drawn on exactly how much better the new arrangement is compared to a conventional system, but he said that the difference will be noticeable. The camera has a flange back (the distance between the lens mount and the sensor) of just 17.7mm but the rear element of some of the lenses can extend 7.5mm beyond this into the body. In development for three years, this mount is designed to make the most of the mirrorless construction of the camera by placing the rear element of the lens as close as possible to the sensor. ?The very short back focus helps to keep image quality very high,? says Kawahara, ?as the light does not have to travel far and has less room to divide. This way we avoid chromatic aberrations, which helps maintain resolution right across the sensor from corner to corner. We have used a wide lens throat, so the rear elements can be large and so the exit angles from the edges of the lens to the corners of the sensor are close to 90°.? While the company has already announced three lenses with the body, Kawahara explained that within the next three years there would be six more. At CP+, I asked how the optical viewfinder would work with a zoom and Kawahara explained that the brightline guides in the viewfinder would be able to adjust as the zoom was operated. The transition from one focal length to the next will be smooth and continuous, not stepped. The company is still discussing how it will deal with focal lengths wider than the optical viewfinder can currently cope with. ?At the moment the widest lens we have announced is 18mm (27mm in 35mm equivalent) and when this is used the optical viewfinder does not quite show 100% of the area that will appear in the picture? said Kawahara. ?In the future we will introduce wider lenses, such as a 14mm, but we still have to determine how this view will be displayed optically. Of course, the electronic viewfinder will show this view easily, but the optical viewfinder will not.? Options for a wider view might include a hotshoe-mounted adapter, or perhaps a clip-on adapter that fits over the existing system. I got to use a final production model at the show, but in a very dimly lit locker room behind the booth. It is easy to forget that the camera is an APS-C model as it has a height and stature reminiscent of the Mamiya 7 series of 120 film cameras ? though it is a good way short of Fuji?s own current 120 models. It is surprisingly un-heavy and the lenses are also a lot lighter than you might expect. In the dim conditions the optical viewfinder seemed darker than the EVF, but in normal shooting situations this might be different. One thing I immediately noticed is that the EVF locks up while the camera acquires focus, so if you are panning or the subject is moving there is a difference between what you see in the viewfinder and what will be photographed. From the moment you press the shutter release ? until the camera focuses ? the view in the EVF remains the same, as the EVF does not refresh while focus is being found. In brighter light the focus will be quicker, but I think this could be an issue for the sort of low-light photographers who will be attracted by the wide maximum aperture lenses the system provides. I asked Kawahara about this and he confirmed that the model I was using reflected how production models would behave. Obviously, when using the optical viewfinder there is no such delay. The EVF in the X-Pro 1 refreshes 40 times a second, which is a little behind other models that do so 60 or 120 times per second. But Kawahara said this issue can be improved via a firmware update and is not necessarily a permanent characteristic of the camera. Fuji is keen to emphasise that the camera has very traditional controls and that once the viewfinder is raised to the eye there are few reasons to take it away to adjust settings. With the shutter speed dial on the top-plate operated by the right hand and the apertures around the lens with the left, it does feel very straightforward. A nice touch is that the aperture ring clicks in third stops, but has a more definite click on full stops ? so you can feel where you are even without looking at the projected display in the optical or electronic viewfinder. I tried the HG-XPro1 handgrip, which makes the camera more comfortable to hold if you were shooting for long periods. Normally a grip like this would be needed on flat-bodied cameras when a heavy lens or flash unit was fitted, but the three lenses that exist so far are not so heavy that they need a grip. It is a nice addition all the same, and I think my preference will be for shooting with the grip attached. The only downside is that the battery and memory card compartment is accessed via the base of the camera, so the grip needs to come off to switch power or storage sources. With an estimated 300 shots per charge (with the EVF on) and a 16-million-pixel raw+jpeg combination that base compartment will need to be accessed quite often. It is impossible to draw any proper conclusions about a camera system in just half an hour in a dingy room at a trade show, but my first impressions of the camera are mostly positive. It is a big camera, but comfortably so, and the lenses are small enough that they?ll fit in coat pockets if you don?t want to take a bag with you. The controls are satisfying to use and the X-Pro1 definitely feels like a ?real? camera. The AF might not be mind-blowing and the EVF is a little ?first generation? but I suspect that most buyers will be more interested in the optical view anyway. With the optical magnification the longer 60mm bright frames are great to use (Leica could learn something here), and I hope that the refresh will be improved before wideangle fans are forced to use the EVF when the 14mm lenses arrives. In all, though, it is a very pleasing camera to hold, to operate, to look through and to hear go ?click?. I look forward to the AP in-depth test, and I suspect this will be a camera our readers will want to own.